You can get your daily news updates instantly via Twitter by following @whthome or join me on www.facebook.com/WolfgangHThome where the articles also ‘cross load’. Read the daily postings on my blog via www.wolfganghthome.wordpress.com which you can also ‘follow’ to get immediate notification when a new article is posted. Many of my articles are also published via www.eturbonews.com/africa with added news from the African continent and the world of tourism, aviation and travel at large. Michelin star rated chef Tomikawa San, currently thrilling the tastebuds of Nairobi’s high society at the acclaimed Mandhari Restaurant of the Nairobi Serena Hotel, will be relocating for a guest appearance to Kampala soon, where he will from 30th of July till 02nd of August inclusive cook his heart out. All the finest Japanese dishes, using original ingredients and spices brought from Japan for the event, will be available for guests of the Kampala Serena Hotel, which again lives up the its ‘Leading Hotels of the World’ status. 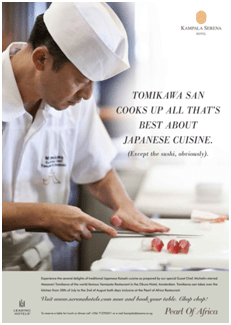 Tomikawa back home in Japan is one of Okura Hotels’ leading chefs, on this occasion doing a stint for Serena Hotels, the region’s leading hotel group, which will be featuring a Japanese week in all their city properties across the East African region. The promotion has long roots in Serena’s policy to regularly bring in visiting chefs, to promote fine cuisine amont their clientele but also to allow their own chefs learn from such experience and try their hand, successfully as it has turned out, in ‘fusion cuisine’ which incorporates new techniques and new forms of presentation. Time to make an appointment with the Kampala Serena, for lunch or dinner or several times, because that is where fine cuisine is celebrated best in Uganda. 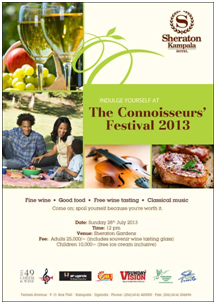 The Sheraton Kampala Hotel is according to Director of Sales and Marketing James Rattos all set to host the ‘Connoisseur Festival 2013’ which will be staged this coming Sunday in the Sheraton Gardens, where the hotel intends to acquaint Kampaleans with the finer side of food and drink. James, when asked to comment on the food and drink festival, had this to say: ‘This is a special event which will bring together a couple of wine suppliers, Including No. 49 Cheese and Wine, Ambar International, Uganda Wines and Spirits and the Wine Garage. Guests will have an opportunity to visit the suppliers’ stands to sample wines as well as buy bottles of their favourite wines. Kampala Music School have put together an orchestra to entertain guests the whole day. Guests will be able to purchase picnic boxes from Sheraton Hotel and relax on their mats as they enjoy the music and wine. This will be a nice family day out as we will also have entertainment such as bouncing castles available for the little ones’. 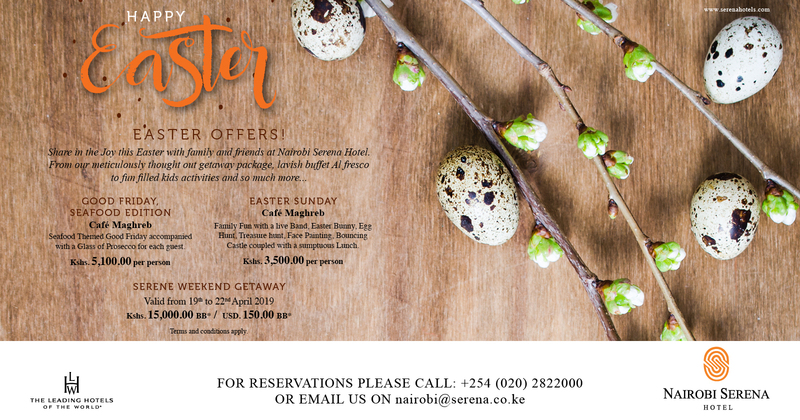 Sounds like a fun day out in the sun for the family and the opportunity for a rare picnic in the Sheraton Gardens, which the hotel lovingly maintains and manages on behalf of the city. The hotel’s restaurants are of course also open for visitors who prefer the more formal setting either indoors or on the outdoor terrace of the hotel. The Sheraton Kampala is owned and managed by Constellation Hotels and Resorts under a franchise agreement with the Starwood Sheraton brand. Up to 2 million Quelea birds were destroyed in recent days over Uganda’s largest rice growing estate in the East of the country, following howls of outrage by local farmers who faced a total loss of their food crops. Last week did the same swarms of birds clean out over 1.000 acres of sorghum in Eastern Uganda before moving on to the rice fields of Tilda Ltd, where they then faced an aerial assault by agricultural crop spray aircraft aimed to save an entire harvest from being destroyed. An emergency task force from the Ministry of Agriculture, assisted by the Desert Locust Control Organization of East Africa had earlier been formed and acted with due haste to put measures in place to destroy the swarms. Locusts, but also Quelea birds, are the local farmers’ most feared invaders and in the case of this particular swarm farmers were counting losses of hundreds of millions of shillings already as tons of nearly mature grain ended up in the stomachs of birds instead of being processed as food for Uganda’s population. There have been some isolated complaints from local ornithologists over the massive eradication of the birds but as they are considered pests their destruction did not violate any protection laws. A local ‘birder’ sent in his comment as follows: ‘Those birds are really pests and of little value because they eat crops instead of insects. But our worry is that other birds, even rare birds, also nest near those farms. For sure many of them were also killed because the spray does not make a difference between pest birds and useful birds. For that reason there have been complaints. We are not opposing spraying as such but just point out what the military types call ‘collateral damage’ to other bird populations. Those losses we regret a lot’. It is understood that this is the first major such operation over the 30+ hectare rice fields of the Tilda estate in about a decade, taken as a rare measure since all other forms of bird control failed, and only in view of the extremely large number of birds this year descending on Uganda’s rice fields and other farms. Watch this space. Kampala residents have celebrated a court ruling, which slapped a fine of 20 million Uganda Shillings on the fancied Emin Pasha Hotel in Kampala’s suburb of Nakasero, after an elderly resident in a nearby house filed a complaint over too much music and noise. In the past, many Kampaleans have unsuccessfully tried to stop churches from blasting sermons and songs from speakers from the early hours of Sunday and open air discos playing tunes at mega decibels until the wee hours. In most cases, complaints led to nothing but aggravation for the complainants, costing them nerves, time and money with no tangible results to show for, leading in some cases to violent confrontations or even, or so goes the grape vine, sabotage on power lines and equipment to for once enjoy a sleep in on a Sunday morning or a peaceful night’s sleep. The hotel was also ordered to comply with the court ruling within 14 days and stop any activities in the future which could result in neighbourhood disturbance, while the Executive Directors of the Kampala City Council Authority and of NEMA were ordered to strictly enforce council bylaws and regulations vis a vis noise pollution across the city, and that not being enough, provide court with regular updates on how the regulations are now enforced. City residents have taken fresh hope now that with this ruling in place – though there appears still the option of an appeal – they will at last be able to have their own complaints dealt with under the same ruling, compelling city and NEMA enforcement units to crack down on illegal open air discos, restaurants and bars making too much noise at night, beyond opening hours.Watch this space. Data received from the Uganda Civil Aviation Authority confirm what top managers told the recently held Routes Africa aviation conference in Kampala, namely that the airport continues to see double digit growth over past year’s passenger numbers. Details show a 14 percent rise in numbers of passengers for the first 6 months of 2013 over the figures in 2012, which at the end of last year stood over 1.2 million passengers arriving, departing and transiting at Entebbe. This amounts to around 38 percent of all arrivals into Uganda, the balance coming across the land borders from Kenya, Tanzania, Rwanda, South Sudan and Congo. Aviation observers are now speculating if the CAA, owners and managers of Uganda’s primary international airport, will speed up the relocation of the cargo facilities near the main terminal to create the space to expand arrival and departure lounges. With more airlines expressing interest to fly to Entebbe and the existing airlines adding more flights or using larger aircraft, the four departure lounges, reached through only two security gates, and the space in the passenger check in area are getting tighter all the time. A masterplan for the expansion of Entebbe has of late been updated and CAA sources during Routes Africa confirmed that they are planning to invest over 400 million US Dollars to modernize systems, expand the terminal building, create added parking areas and relocate all cargo operations to the ‘old airport’. Unknown to many has Entebbe also become the United Nations’ largest aviation and logistics base in Africa, from where peacekeeping and humanitarian emergency relief missions are organized. Said a regular source close to the CAA: ‘We know the airline operators have many issues with us. We are aware of complaints about the distance passengers must cover to reach the terminal from the parking and we are working on that. A new parking area is being constructed and will be connected to the terminal with covered walk ways. We are also looking at ways and means to provide cover for the staircase up to the departure level because when it rains our passengers are exposed to the elements. The security boys are stubborn however and want to keep all vehicles away from the terminal building but we are competing with other airports in the region where they do not have such restrictions. A compromise must be found between security and passenger convenience. You are right when you keep saying in your writings what is the check at the perimeter for when they then keep the vehicles away from dropping off passengers? If they do their job right at the perimeter they can let cars get to the terminal. It works in Kigali and even more in Nairobi. Those security boys of ours are just too stubborn and have no understanding of customer care and how to make an airport user friendly. But we have not given up hope. The problems with congestion at peak times and how to get to the terminal and out of the terminal are known and we are working on those’. Tourism stakeholders in contrast voiced their concern however if these double digit growth figures can be sustained now that the government has added 18 percent VAT on tourism services like hotel bills, which were previously exempted, leaving tour companies with stark choices as several tour groups have reportedly cancelled their holiday plans for Uganda when asked to pay up the extra cost. Safari prices, once quoted, are considered to be firm leaving operators in the country with little option but to either absorb the added tax burden or else carry out business at a loss. Efforts however are underway to lobby parliament through the committee on tourism to have these proposals made by the finance minister in the annual budget presentation overturned. The Uganda Tourism Board recorded an increase in tourists by over 20 percent last year in the wake of being named the Lonely Planet’s top destination and for 2013 has National Geographic put Uganda in their recommended top 10 destinations too. Two teenage climbers were evacuated from Mt. Kenya, when they fell seriously ill with high altitude sickness. A rapid response team of Kenya Wildlife Service rushed to their aid when information was passed to them that two British teenagers aged 16 and 17 showed signs of falling victim to the effects of rapid ascent, lack of enough oxygen and general exhaustion. The two were part of four climbers attempting to conquer Lenana, one of Mt. Kenya’s peaks. The same source also confirmed that KWS emergency personnel had earlier in the week evacuated another climber and also taken to the Nanyuki Cottage Hospital. The two are said to be steadily recovering. In 2012 over 27.000 visitors came to Mt. Kenya National Park, many of them hiking and climbing due to the easy access to high elevations by vehicle, before then going on by foot. ‘One of the problems with acute mountain sickness is the ease how high climbers and hikers can reach by vehicle. That robs them of the time the body needs to acclimatize and get used to less oxygen. Most of the cases when KWS has to evacuate have roots in that but of course there are other cases where climbers and hikers are just falling ill even after taking a slow pace to reach high elevations. For sure KWS has again shown that safety of visitors is paramount and the staff are well trained in mountain rescue operations’ said the source when confirming the two incidents. Mt. Kenya National Park is also recognized as a UNESCO World Heritage Site, only recently expanded to include the conservancy of Lewa Downs, giving the extra ‘pull’ to bring in visitors from abroad. Visit www.kws.org for information on all the national parks, marine parks and game reserves under KWS mandate and www.magicalkenya.com for added details on the country’s natural attractions. As was reported here some time back, the Ol Pejeta Conservancy was the first among Kenya’s private wildlife sanctuaries to commit to the introduction of airborne surveillance by using UAV’s today better known as ‘drones’. Supported by Kenya’s corporate world as well as individuals has the money been raised to go ahead with the development of a vehicle capable to carry out complex tasks and suited to the weather over the Laikipia plains, and word from Ol Pejeta now has it that the first drone is ready for test flights at the manufacturer. The UAV will be known as ‘Aerial Ranger’ in direct reference to the rangers on the ground, who will in a few weeks time receive surveillance data and real time information about suspicious movements of people outside and inside the conservancy. Information sent to this correspondent by the Ol Pejeta team states: ‘From the start we have set out develop a bespoke drone for conservation with new tracking capabilities and greater flexibility to integrate sensor and operation developments in the future. Whilst there are many off- the-shelf solutions out there, including numerous ex-military options, we believe that it is best to spend time and funds ensuring we have a drone that is truly fit for our purpose. In this instance, more flight testing is required to ensure the reliability and feature set for our anti-poaching drone solution before we are ready for fielding. 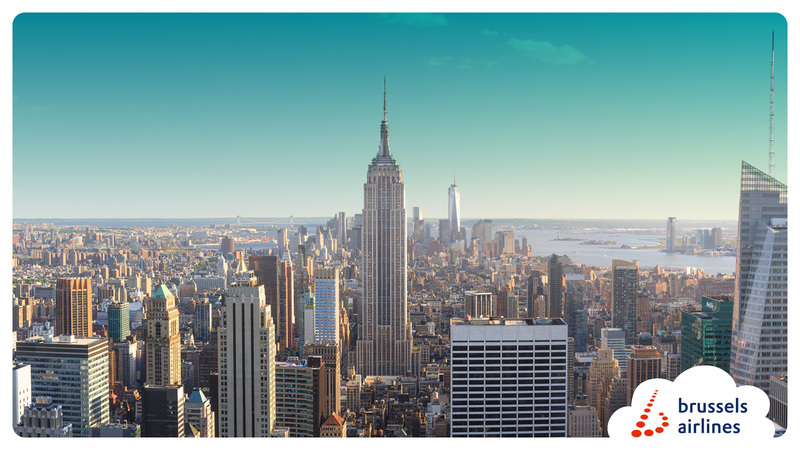 In particular we are keen to find ways to maximise the range of our RFID tracking capabilities. We would like to ask our supporters to bear with us a little longer as we lock this down through a series of rigorous flight tests. As ever, we are keen to keep you up to date as we take this journey, developing the aerial ranger and finalising approvals in Kenya’. The new bird, when operational over Ol Pejeta, will have a reach of up to 125 kilometres of flight distance and can remain airborne for up to 2 hours at a go, making the acquisition of more than one of these state of the are aerial surveillance systems likely, if not necessary to ensure seamless surveillance of the sprawling estate. Special thanks go to KLM and to DHL as both companies have gone to great lengths to donate to this project, with KLM Cargo very likely to fly the new bird to Kenya where it will then be assembled, inspected by the Kenya CAA for compliance with aviation regulations and then deployed in the skies over Ol Pejeta. Watch this space for updates. Kenya has agreed on a financing arrangement with the World Bank to create a direct road link with South Sudan’s capital Juba, which would allow goods transported by road to use a more direct route to and from the port of Mombasa than the present link via Kampala. The 600 kilometre road from Eldoret in Western Kenya to the border post of Nadapal in South Sudan will link up with a section of nearly 350 kilometres from Juba to Nadapal, which according to information from sources in both countries is already in progress. The main section in need to upgrade is from Kenya’s northern town of Lodwar to the border in fact, as the Eldoret to Lodwar road is already an all weather road. The new road link, when complete, is thought to reduce the cost of transport but also the hassle of having to send cargo through Uganda, which presently requires two added border crossings with all the inherent challenges, and problems, to limit the shipment of goods to one entry and one exit inspection only, both ways. The road project has reportedly been demanded by manufacturers from Kenya exporting their goods to South Sudan, to increase their market share at the expense of Uganda, which has in the past years reached a dominant position for exports to South Sudan as a result of shorter access routes. When the new road link is ready, it will strengthen the existing cooperation between South Sudan and Kenya even further, as the LAPSSET project, which will connect the new deep sea harbour of Lamu by road, rail and pipeline to South Sudan – and Ethiopia for that matter – is already seen as a milestone infrastructure project of a symbiotic nature between the two countries. The main road from Kampala via Gulu to Nimule, the border town in South Sudan, has for long been dogged by problems during the rainy season and while much of the new highway from Juba to the Ugandan border is ready, the delays on the Ugandan side have been responsible for regular delays between the two capitals. The once almost imminent start of a railway link between Gulu and Juba has also not progressed much further, leaving Kenya once again ahead in the race to create facts on the ground through infrastructure developments, which will ultimately aid their trade links with South Sudan over their regional competition. South Sudan has applied to join the East African Community and is currently undergoing assessment on their state of readiness vis a vis harmonization of laws, regulations and institutional alignments and Kenya, needless to say, is one of South Sudan’s main backers for their admission to the regional grouping. When Dr. Paula Kahumbu, the East African Wildlife Society and ANEW carried the day a few weeks ago, as the tribunal upheld their legal challenge that the EIA for the section of the planned bypass cutting across Nairobi National Park land was invalid, conservationists celebrated. Now however, the facts on the ground support suggestions that the work is going ahead nevertheless along the sections before the bypass would enter the park at the Ole Sereni Hotel and beyond the Carnivore Restaurant, where it will leave the park and connect with road works and flyovers already in place. One source, reluctantly and on condition of strict anonymity, in fact said that Kenya Wildlife Service will not oppose the required degazetting of the section of the park, should the case go, as legally required, before parliament. The organization, as reported here before, has been promised a significant amount of cash to purchase additional land on the other side of the park where they would like to expand the boundaries, in exchange for compliance and looking the other way. ‘Look at it as a trade off, the lesser of two evils. I know that many corporate organizations helped to grow trees along the park boundary over the past years. The spend time and effort and that fledgling forest will of course be cut down. That is discouraging for everyone who planted, gave money and did their civic duty and give community support. But the government will not budge. They want the bypass to be open and ready as soon as possible. They might go to parliament for the formal act of degazetting but may also just go ahead with the work at the same time. There is no telling what they will do. Traffic through Nairobi is a nightmare every day and they will have popular support when pushing this project ahead. Paula and her partners are right though. If the government is allowed to get away with such impunity, who says they will not cut through sections of the Nakuru National Park for the planned bypass of Nakuru town? The new railway line planned from Mombasa to Nairobi has to go through the Tsavo Park. Once they have a precedent, they will use it in future cases elsewhere. Who says that in years to come, maybe in a decade or more, or less, the same government will not attempt to degazette more Nairobi national park land for another new railway, or a new posh housing estate. Where money can be made, be sure we Kenyans find a way to make it. There could be billions at stake in construction and land values and my best guess is, if it cannot be stopped now, going if necessary to the highest court and then to the East African Court of Justice, the flood gates will open’. The park section is approximately 5 kilometres long, connecting two crucial links to allow traffic from Mombasa to avoid downtown Nairobi when heading for the Rift Valley towns of Naivasha, Nakuru and beyond to Kisumu, Eldoret and the border with Uganda, and with the project cost at well over 17 billion Kenya Shillings, and a large amount of that already spent on actual road and bridge construction, there will be no let up from government to push ahead with the project, as some say by hook or crook. Should the ruling by the National Environmental Tribunal be ignored, it would amount to contempt of court and immediately prompt applications to the Kenyan High Court to enforce the earlier ruling, but only time will tell where this issue is heading and how it plays out in the end. Watch this space to be sure to get the latest updates. Information is emerging from Nairobi that Equity Bank may have thrown in their support and weight behind a winding up petition filed by aviation fuel supplier Fine Jet, which is seeking the dissolution of Jetlink and the subsequent sale of all their assets to pay creditors. The airline ran into trouble when South Sudan’s Central Bank stopped the remittance to Kenya of an accumulated nearly 2.5 million US Dollars in ticket sales from Juba, citing lack of foreign exchange, a situation mirrored many times with other suppliers of goods and services from Kenya and the region in following weeks. The renewed flow of oil money, after the lifting of the self suspension of exports via the pipeline to Port Sudan, gave brief hope that those funds would be remitted after all, giving Jetlink a lifeline. The threat however by the regime in Khartoum to halt pumping South Sudan’s oil through their pipeline, effective in the second part of August to give the production sites time to effect an orderly shutdown, has already seen exports reduced to 100.000 barrels and the much needed cash from this resource will again go to zero, should Khartoum indeed block this route. South Sudan has been in talks with a Japanese led consortium to build a new pipeline from their oil fields along the border to Khartoum Sudan, but at best this will be going in operation in 4 years time, terminating in Lamu. There the Kenyan government, in conjunction with Ethiopia and South Sudan, is constructing a new deep sea port and oil export terminus under the LAPSSET project, which also foresees the construction of a highway and railway connecting Juba and Addis Ababa with Lamu. Meanwhile though has Jetlink’s hope to get their hands on the cash held hostage in Juba dwindled once again, leaving the possibility open that, inspite of reaching some form of agreement with nearly two thirds of their creditors to waive a portion of the debt and then agree to a debt for equity swap, will be in vain. Fine Jet and now Equity Bank appear set to push through their demand in court for a winding up of the company, which would see one of Kenya’s first privately owned jet airlines, serving domestic and regional routes, disappear for good from the skies over Eastern Africa. Watch this space for breaking and regular news updates from the aviation sector of the East African countries. The fourth edition of the Kenya Fashion Week will be held on the 24th August at the soon to open Villa Rosa Kempinski in Nairobi, a media release received overnight confirms. Sanjeev Sharma, Marketing Director of Just Like That Ltd., the event organizers, provided the details of an exciting programme ahead in a month’s time which is once again aiming at showcasing Kenyan fashion designers and their creations. Originally launched as Trendz Kenya Fashion Festival did the event transform into the Kenya Fashion Week, now a growing brand among the socialite events in Kenya and East Africa. The day will kick off from 9 a.m. in the morning with an exhibition running till midnight at the hotel’s The Source and the runway shows will unfold from 6 p.m. until 11.30 p.m. before it is party time for the rest of the night, hosted by Nairobi’s latest addition to the luxury hotel scene, the Villa Rosa Kempinski. The Mombasa County Police has just taken delivery of 6 state of the art rapid response team cars, with the full fleet eventually comprising 30 of them. Equipped with the latest communication equipment, connected to the net and featuring 360 degree cameras, able to zoom in on targets up to half a kilometre away, the new car fleet will undoubtedly boost security, something leading tourism and hotel stakeholders have been demanding for long. The high season is now underway at Kenya’s coast and the return of several charter flights from abroad, bringing tourists directly to Mombasa, is promising to make up for the poor first half of the year, when fears, ultimately proved entirely baseless and hyped up by unfriendly media, over potential election violence led to a significant slump in arrivals in both Mombasa and Nairobi. During the recent visit of President Obama to Tanzania, where he was hosted by President Kikwete, did another ‘hosting’ go down largely unnoticed. 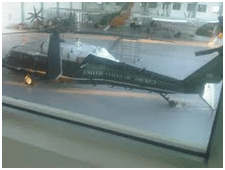 The hangar of Precision Air, Tanzania’s premier private airline, ‘hosted’ the helicopter popularly described as Marine 1 when the US President is on board, creating a bilateral meeting of rotor and fixed wing aircraft between the two countries. Dar es Salaam’s often sweltering heat and intense sun no doubt made this ‘visit’ to the hangar a must for a bird used to cooler climes, and perhaps both the shade as well as the opportunity to carry out safety checks away from prying eyes must have played a role. 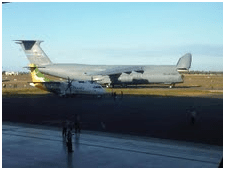 Other support aircraft, which came with President Obama to Tanzania, were also seen parked outside the Precision Air hangar, dwarfing of course the ATR of PW by the look of it. Now that the visit is long past, time to reveal some of the little inside details to our readers and to share the pictures as evidence, in case some doubting Thomas’ would wish to challenge the printed word on its own. Enjoy! The Zanzibar Association of Tourism Investors, in short ZATI, has made urgent representations to the central government authorities in Dar es Salaam and the government on Zanzibar to improve security arrangements for the islands of Unguja and Pemba. The investor representative body, which accounts for financial investments worth more than half a billion US Dollars, mentioned that lack of security or the perception of lack of security is an impediment for more investments as well as for attracting more visitors to the sundrenched beaches of Zanzibar. In a pro-active approach has ZATI commissioned a study to outline the challenges security issues pose and to make practical proposals how best security organs can deal with the problems arising from less than ideal security preparations. 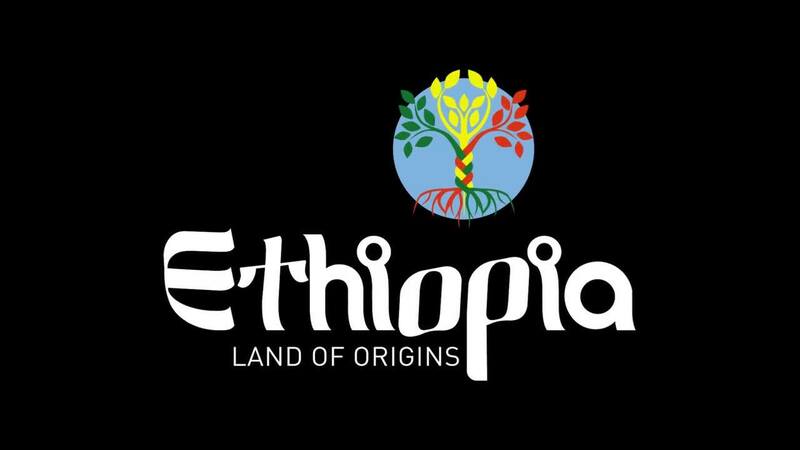 The association also asked for a review of the respective legal and regulatory framework in a consultative way to bring laws and regulations into the 21st century while advocating for a new tourism strategy to be formulated. ZATI’s Director and Advocacy Officer Pamela hit the nail on the head when she quoted 15.000 direct and up to 50.000 indirect jobs originating from Zanzibar’s tourism industry: ‘Income from tourism benefits not only investors but also has a strong social and economic impact on Zanzibar. Failure to safeguard the industry and develop a safety and security strategy leaves Zanzibar at risk of damaging its economy in the long run, leading to decreased contributions of tourism to the GDP. Foreign [exchange] earnings will fall, the number of visitors will dwindle and jobs will be fewer’. Zanzibar’s tourism minister Mr. Said Ali Mbarouk acknowledged the concerns and promised consultations with the tourism private sector, while also pointing to the establishment of the police’s tourism patrol unit as a first responder as well as working towards crime prevention. ZATI chairman Abdul Samad was also quoted to have said: ‘I hope that a robust and effective judiciary system will go a long way towards deterring criminals’. ZATI has been in existence as the primary private sector voice for over a decade now and brought together stakeholders committed to advancing Zanzibar’s tourism agenda, increase visitor arrivals and help create a conducive environment for new additional investments in hotels, resorts, restaurants, tourism attractions and, vis a vis the public sector, the upgrading and enhancement of much needed infrastructure at the airport, with roads, water and electricity supply being key of attracting more business to the Spice Island. Watch this space. One of Tanzania’s hidden gems, the Lake Chala Safari Camp, has just opened their latest addition, 5 luxury tents set right on the rim of the crater with magnificent views of the lake and Mt. Kilimanjaro. Carolyn and Rob Waltenberg, the owners of the camp, have been working on this upgrade for some time, initially offering a campsite, then a simple tented camp where location and ambience more than made up for the lack of 5 star amenities until they completed their most ambitious project yet, the addition of 5 new en suite tents and a general modernization of Lake Chala’s facilities. Lake Chala, a crater lake with an elevation of about 900 metres above sea level, is accessible from both Kenya and Tanzania but the setting of the camp is no doubt using the best vantage point of them all around the rim of the crater. The views are as good as they come and of the kind which evokes that single word, followed by a moment of silence to take it all in ‘awesome’. Birdlife is prolific and in fact one of the main attractions for coming to this less visited part of East Africa, besides the solitude visitors can find here. Bird species include, depending on the season, a number of migratory bird species as Lake Chala is within one of the main North – South – North migration corridor but also a good number of birds regularly seen in this part of Tanzania. Not being inside a national park has its advantages here as bush walks, with guides, can be arranged by the camp as can be boat rides on the lake, watching the birds from the water side. The main buildings of the camp, now more of a lodge really, are perched right at the edge of the rim and allow, from the lounge and restaurant, sights of the not too far away Mt. Kilimanjaro, Africa’s highest mountain, from an angle otherwise rarely seen. The new kitchen produces great home cooked meals, not aimed to compete for Michelin stars but aimed to fill hungry stomachs with good food prepared from fresh ingredients, most of them organic. The Lake Chala Safari Camp is located not far from the Taveta border crossing between Tanzania and Kenya, some 50 odd kilometres outside the town of Moshi and some 80 kilometres from the Kilimanjaro International Airport. Visit www.lakechalasafaricamp.com for more details, information on birds regularly seen, flora and fauna and also for tariffs and bookings. Information was received from a source in Juba, South Sudan’s capital city, that the government was set to launch an additional category of passports, especially designated for the business community. Presently South Sudan has four categories of passports, diplomatic, official, special – a category remaining rather obscure and undefined as to the user group – and those for citizens, ordinary citizens that is. One of the requirements of obtaining the new passport is membership at the South Sudan Chamber of Commerce, but other criteria, according to the source, are required too before this passport type can be issued. Among them is a clean police record, a company registration at least three years old, bank statements covering the period, evidence of tax payments and a recommendation, likely from the Chamber of Commerce. ‘I do not know the benefit of the new passport type. Those with regular passports already travel. I am not sure if there is any advantage when going to other countries and how they will recognize this category or when coming home to Juba. Maybe here they can get special immigration treatment but abroad, I am really not sure what their immigration officers will do different. We still need Visa, maybe embassies will treat Visa applications from such passport holders differently but their rules might not allow for that’ added the source when passing the information. Well, travel safe and happy landings, no matter what passport you carry, if you come from South Sudan and visit the region, the continent and the world at large. CNN’slatest rankings for the 10 best golf courses in Africa has come up with some stunning results, for both winners and those who lost out on the top 10. Mauritius tops the rankings with 2 acclaimed golf courses, the Heritage Golf Club in Bel Ombre and the Bernard Langer designed Le Touessrok on the Isle Aux Cerf, but it should be noted that the island has another 5 championship courses with one more under final planning. Needless to say does this attract visitors from around the world, who want to come and play golf under the tropical sun. The Constance Lemuria Resort on the Seychelles island of Praslin is singled out too for ‘membership’ in the African top 10, the only course on the archipelago’s second largest island and a magnet too for tourists coming to tee off on this award winning course. South Africa too got two courses into the top 10, and Namibia, Morocco, Tunisia, Egypt and Zimbabwe have on each featured. Half of Africa’s over 850 championship courses are located in South Africa, testament to the popularity of the sport there and of course bringing in aficionados from all over the world to play on them. Notably though has Kenya and the rest of East Africa missed out on the honours, inspite of such great courses like Muthaiga in Nairobi, Windsor in Nairobi, the Leisure Lodge club in Diani or the more recently introduced Vipingo course north of Mombasa in Kilifi. Golf tourism in Kenya has made its mark in recent years, voted even as the most upcoming golf destination, but generally in Eastern Africa, notably in Uganda, Rwanda and Burundi, perhaps Tanzania too, golf is still seen as a game for the rich and perhaps for lack for foresight new courses are few and far between. ‘In Nairobi alone we got Railway, Karen, Royal Nairobi, Limuru, Muthaiga, Windsor and a few others on the outskirts of the city. In Mombasa we have the Mombasa Golf Club and Nyali and in every major town we have a golf club. Maybe when looking at the CNN rankings we need to take a fresh look on improving those courses or establish new ones. Sports tourism is big business, airlines carry golf bags literally for free outside the normal baggage allowance and golfers spend a lot more than average tourists for their accommodation, meals and extras they pay for. I am disappointed that none of our clubs made it into the top 10 for Africa. It is maybe a wake up call to pull up our socks and do something about it’ commented a regular tourism source from Nairobi when asked to respond to being left out of the Africa Top 10. Indeed, a wake up call for East Africa, considering that the Indian Ocean islands of Mauritius and Seychelles took three of the top spots leaving us trailing in their wake. Kenya’s tourism board, via www.magicalkenya.com has listings of golf courses across the country, where some fancied resorts like the Mount Kenya Safari Club in Nanyuki and the Aberdare Country Club in Mweiga feature their own 9 hole courses for their guests. Congrats to the winners and a well done to those which did not make it into the top 10 this year. Try harder for 2014. Fregate Private Island has just become part of the fancied Oetker Hotel Collection following the signing of a resort management contract between the owners and Oetker. The existing resort has since July put the Oetker name to it, and the reputation and reach of the Oetker Collection among the world’s most discerning travelers will no doubt bring their aficionados to the Seychelles, to find out what new level of luxurious hospitality they will find. Comprising 16 villas, between 400 and 700 square metres in size, each featuring their own infiniti pool and a Jacuzzi, the guests have access to 7 stunning beaches dotted around the island. Fregate is known to be the home of the second largest community of the giant Aldabra tortoises and myriads of birds, which call the lush forest of the island their home. An extensive vegetable, fruit and herb garden provides the chefs with fresh organic ingredients, which are used to enrich the cuisine with daily changing menus. Good news for the Seychelles no doubt as the individual marketing efforts of the Oetker Collection will now complement the ongoing marketing juggernaut of the Seychelles Tourism Board and private sector, bringing yet more spotlight on the archipelago and drawing in more clients. Seychelles, truly Another World’. As the Seychelles are gearing up towards the Feast of Assumption on 15th of August, a unique celebration of Christian traditions on the island of La Digue, has the Seychelles Tourism Board already launched the 2013 promotional poster for the Festival Kreol, coming up during the last week of October. The La Digue Feast of Assumption is an annual event, which has in recent years gained greater prominence as the Seychelles’ tourism gurus have looked at all aspects of how to promote the archipelago better abroad, highlighting their cultural background, music, poetry, sports – like the Ecomarathon or the Seychelles Regatta – beyond the sun, sand and sea for which the country is of course best known. Celebrating heritage and culture, both elements deeply engrained in Seychellois’ society, and turning events into tourism attractions, has brought more visitors to the archipelago than ever before. Seychelles’s capital of Victoria, known also as the capital of the Kreol world, will be at the heart of the Kreol Festival which will take place between 25th and 31st of October, during which song, dance and poetry, but also art at large will be featuring on the main island of Mahe. Meanwhile has the Ministry of Tourism and Culture started to finetune preparations for the end of the year festivities, kickstarted through a meeting with Seychelles’ best musical performers and choirs to launch a memorable ‘Christmas with the Stars’ programme aimed to entertain both Seychellois and their tourist visitors over the festive end of year season. Much to look forward to for sure and as always Seychelles, truly Another World. 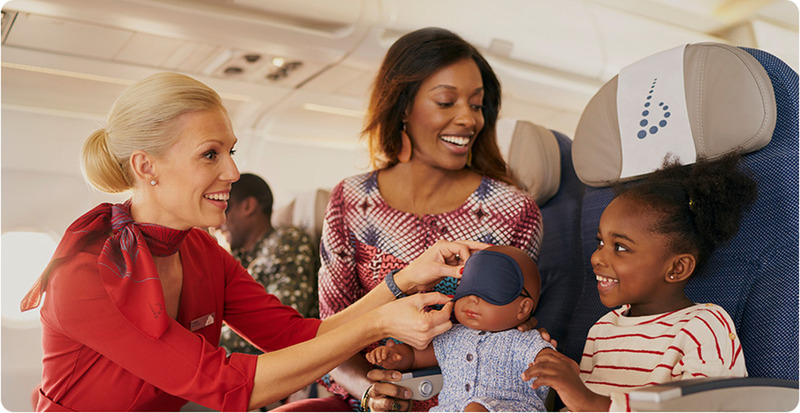 Kenya Airways has with immediate effect added a fourth weekly frequency between Nairobi and Mahe, making one of the world’s most fancied destinations even easier to get to. Operating, depending on demand on a particular flight, with the Embraer E190, the B737-700 NG or on occasions even the B737-800NG, the added flight now offers passengers connections on Sunday, Tuesday, Thursday and Saturday, ideal for a short vacation to celebrate a special event, anniversary or birthday for instance. Demand for the islands has risen in past years especially from the African mainland, supported by the visitor friendly policy of the Seychelles of not needing any Visa. All tourists require is a confirmed hotel booking, which can be done via www.seychelles.travel where options from the poshest villas to the simplest Bed & Breakfast area available, a return ticket and sufficient funds to sustain the stay. Visitors from Africa arriving with Kenya Airways also require a valid Yellow Fever inoculation certificate. The introduction of Tourism Ambassadors in many African countries has also helped to get the Seychelles into the local media, resulting in growing interest and rising demand. Besides the glitz and glamour of the archipelago, which indeed draws the rich and famous of this world to the islands, the Seychelles Tourism Board also has on offer the Seychelles Secrets which feature many locally owned small hotels, resorts, holiday lets, Bed & Breakfast and self catering establishments, all more than happy to take care of visitors from the mainland travelling to the archipelago on a budget, while the 5 and 6 star rated resorts equally welcome those travelling with plenty of cash at hand for that holiday of a lifetime. Alain St. Ange, Minister for Tourism and Culture, hailed the decision and attributed the addition of the extra flight, initially until end of August but hopefully made a permanent feature in the future, to the efforts of the Kenya Airways country manageress Mrs. Zakiya Vidotwho, who in turn wrote that the efforts of the Seychelles Tourism Board to market the islands across the African network of Kenya Airways was a deciding factor in the airline’s decision to add a fourth flight. ‘We now have the mix of aircraft available to fly to Mahe more often. The range and comfort of the Embraer E190 has made this possible, together with risen demand. The larger Boeings can now be redeployed to other destinations which warrant larger aircraft but when needed still fly to the Seychelles. Seychelles Tourism has made headways in marketing twin centre holidays with selected African countries, Kenya included, and that will allow passengers coming from our African network and from Europe with KQ to do a safari in Kenya or Tanzania or see the gorillas in Rwanda and then have their beach holiday on Mahe or Praslin or any of the other islands’ said a regular source close to Kenya Airways from Nairobi when asked to shed some light on the development. Minister St. Ange meanwhile in a communication to this correspondent earlier today added: ‘We appreciate the support by Kenya Airways. [They] have been a loyal and trusted partner through thick and thin. We value [their] presence in the list of our favoured airlines and assure [them] of our total support. We hope that this seasonal flight will be repeated again later in the year when our busy period comes’. In need of a getaway? 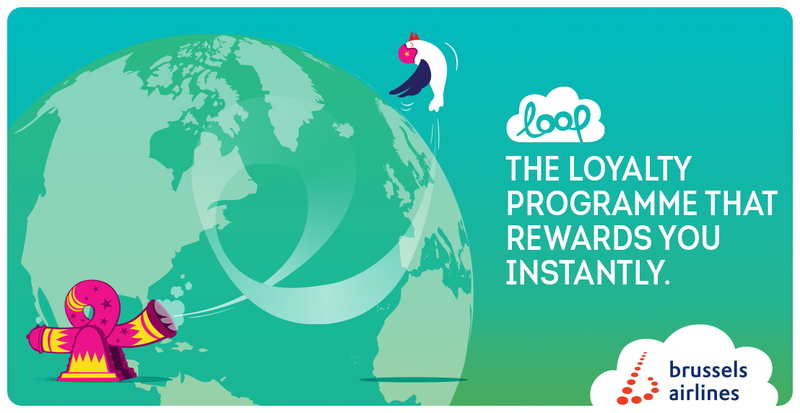 Wanting to impress a loved one? Remember that the Seychelles truly are Another World. 26 October: Zambezi Kayak Festival. We have tried in the past to establish a section of the police force as specially trained tourism police, but always it seemed to die a death. Now, though, government has got involved during the run up to the UNWTO and has trained a special unit to undertake the duties of tourism police. According to a report in the press, 120 police officers from Southern and Western Provinces have undergone training. The course lasted a week and was overseen by Zambia Police Service with some advice from Zimbabwe Police which has had a tourism unit for many years. 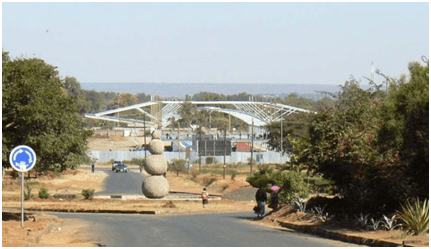 According to a report in the Financial Gazette, African Sun Limited has financed the construction of a conference facility at Elephant Hills because the government had failed to provide one for the UNWTO. The convention centre will take 1,500 people and is being built by Chattels Infrastructure from Cape Town with materials imported from Germany. The convention centre is said to be semi-permanent and has a life-span of 30 years. The construction started two weeks ago and will be completed within the coming two weeks. Paul Clarke, who founded Chattel 19 years ago, could not reveal how much the structure would cost, but C&M understands that the Infrastructure Development Bank of Zimbabwe (IDBZ) provided ASL with close to US$4 million for the construction of the semi-permanent centre at Elephant Hills and upgrading of facilities at the hotel for the UNWTO. Chattel said advantages of semi-permanent structures were that they were cost-effective, manufactured off-site in a controlled environment, more rapidly and simply constructed than conventional buildings, easily reconfigured, easily transportable, technologically advanced, functional and aesthetically pleasing.